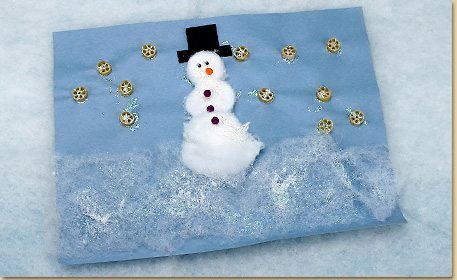 Make a fun winter snow scene that sparkles with white and silver glitter. Using a brush, apply glue to the bottom of the blue paper. Press thin layers of cotton batting down on the paper as a thin layer of snow. Form (3) circular shapes with cotton balls to form your snowman. Glue the cotton balls to the paper as the snowman’s body. Dip the pieces of wagon wheel pasta in glue and attach to the paper to create snowflakes. NOTE: When using pasta with small children, adult supervision is required due to the potential choking hazard. Brush glue over the snow batting, the cotton snowman and the pasta snowflakes. Sprinkle white Glitter over the glued areas to add sparkle. Shake the excess Glitter onto a piece of scrap paper. Fold the scrap paper and gently shake the glitter through the funnel back into the glitter jar. Dress up your snowman! Cut a hat shape out of black foam. Attach the hat, wiggle eyes and poms to complete. Set your scene aside to dry then hang on the fridge or give to a friend! This is a great classroom project for preschool and kindergarten children! Pour glue onto paper plates to share. Have children practice dipping the pasta to practice their fine motor skills and use a brush to practice their sense of control. Tip: adults and teachers, make sure to have hand wipes accessible for easy clean up. You can also cut the foam hats ahead of time for Step 11.